The passion for hockey in Roch Carrier’s classic The Hockey Sweater (1980) feels palpable. The story sets rich textures of childhood memory: pure love of sport, the idea of hero, and an introduction to bitter-sweet rivalry, as a young boy is forced to wear the emblem of his team’s enemy. 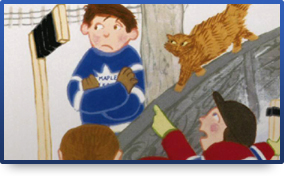 The original title– “An abominable maple leaf on the ice”, animates rivalry, poking fun at the other most storied franchise in the history of the Canadian game. Winner of 13 Stanley Cups, also four-time Conference finalists since the Habs last won it all in 1993; to the south of Montreal, the Toronto Maple Leafs will always be my team. Another less fortunate team, the Québec Nordiques, has become my team to the north. The emblem of the one truly Francophone organization to have existed in the NHL may only seem bizarre on an Anglophone. The hockey t-shirt I bought during my first trip to Quebec City has become a favourite. I wear it often, along with its inherent nostalgia. “Québec Nordiques?” shouts an angry voice. “Yes, are you a fan?” I respond. “WTF?” says his face, turning a deeper shade of red. 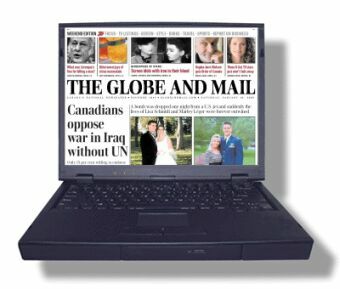 “Tu est un Anglophone. You are from Tree [sic] Rivers and you like les Nordiques?” he spouts. “We study French at l’Université de Québec a Trois-Rivières”, I say. “The people of Québec are very, very friendly”, says my classmate, Tijana Jukic, her most expressive French on display. 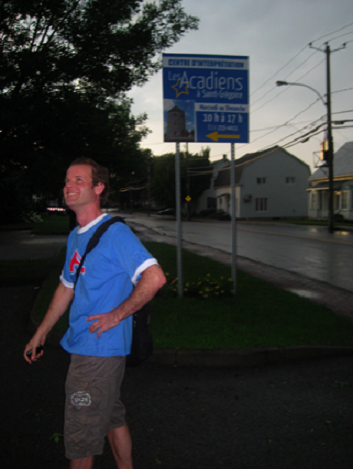 From across the St. Lawrence River, we were attracted to the town of Saint-Grégoire by two needle sharp, futuristic-like steeples of its church, and I would not pray to god to send right away 100 million moths to eat up my Nordiques t-shirt. The unofficial representative of the Nordiques Preservation Society shifts from aggressive to welcoming after a few turns of our aw-shucks French. We stumble along in relief. When the woman behind the lunch counter also appears taken aback by my accent and t-shirt combo, I realize that if I want to keep carrying the symbol of les Nordiques on my chest, I will have to communicate why I don the hockey t-shirt. On the ride back to Trois-Rivières, I express to the taxi driver how, as a Toronto Maple Leafs fan, I feel a kinship to his Québec Nordiques. Mats Sundin, the great Swedish import, graced both clubs with his quiet superstardom. Neither team has won a Stanley Cup (in the modern era). Fans of both teams are long-suffering, revealing passion like an exposed nerve. Both clubs have proud tradition, love of team, and a wellspring of hope. Both teams, then, are of the past and future. Both too have shared as bitter-sweet rival the Montreal Canadiens. I visit Quebec City during the 2010 NHL playoffs, wherein the Montreal Canadiens make their improbable run past the Pittsburgh Penguins en route to their first trip to the Conference finals since 1993. 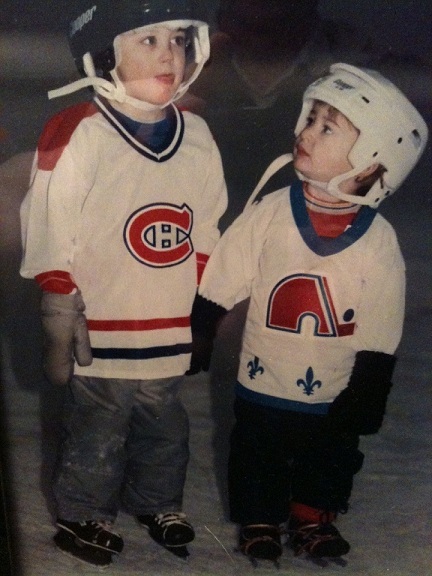 After hearing the cries of adoring fans in my hotel and conversing with them post-game, I think back to the modern battle of Québec (1984, ‘85, ‘87, and ‘93), I watched as a child long as possible, negotiating bed time. The rivalry between the Habs and Nords electrified the whole province then, like two spirits fighting for the same soul. Like the Maple Leafs, les Nordiques, donned the blue and white. In the place of our maple leaf stands a red n integrated with hockey stick, poised for face-off. What a shame these northerners were forced south. What a cruel twist of fate, wrought by the hockey gods, or by a short-sighted provincial government, or perhaps by a non-sentimental and non-Canadian NHL commissioner, that the transplanted franchise would win the Stanley Cup as the Colorado Avalanche, one year after leaving Québec. In speaking to the friendly people at l’Auberge de la Place d’Armes and Pub Saint-Patrick, I get the sense that switching allegiance from les Nordiques to les Canadiens, for some, had meant an uneasy adjustment, a gradual process that eventually felt right. Le Bleu-Blanc-et-Rouge represents the province, as its only NHL hockey team for now. I buy the t-shirt the next day. Fresh jerseys and t-shirts still hang from storefront windows donning the names of Tardif, Goulet, Stasny, and Sakic. Les Nordiques also hang suspended, somewhere in time between 1979 and 1995. As Maple Leafs fans, the 1967 Stanley Cup victory and its following 44-year drought etched into our psyches, we too hold fast to our past. And lest we forget: the Maple Leafs and les Nordiques will return one day. What does that mean to the community, both French and English, and to the city? What will we learn by talking with restaurant and bar owners, hockey players and coaches, merchandisers, the converted, and the die-hard super fans on the street, especially those whose hearts broke more than a bit when Joe Sakic and company packed up and set off for the Rocky Mountains? Or when Dougie Gilmour’s crew went down in history, like Wayne Gretzky…..and Carey Fraser. Hope is building along with the a new hockey arena for Quebec City, and in Toronto who sees its Maple Leafs, amidst a promising rebuild, intent on quenching the six-year playoff drought. Both organizations honour past heroes, and hope to get back to their historical roots, get back into the hearts of dormant fans and…..of course, get back to the important business of defeating the Montreal Canadiens, en route to Stanley Cup victory. Gallery | This entry was posted in Montreal, Québec, Quebec City, Trois-Rivières and tagged L’Auberge de la Place d'Armes, L’Université de Québec a Trois-Rivières, Montreal Canadiens, Pub Saint-Patrick, Québec Nordiques, Toronto Maple Leafs. Bookmark the permalink.